Bathtubs are an expensive investment, and certainly not something you’ll want to be replacing frequently. Often times when people think they need a new tub, the tub itself is perfectly fine- it’s the appearance of the surface that gives off an uninviting look. Here are a few signs to lookout for that might indicate it’s time for a refinishing! If you use your bathtub regularly, it’s common that chipping will occur over time. Between dropping items like bottles of shampoo or soap, or if you have a child that takes toys in the tub, the surface can easily become chipped. Not only does this look bad, but it also means that your tubs protection against moisture is gone. This can eventually cause rust and water damage to the iron or steel that your tub is made for. If your once crisp white bathtub is starting to show a brownish-yellow, splotchy off-white, or pink coloring, this is a clear indicator that your tub needs refinishing. Often times this could be a sign of hard water or mold issues. No matter what the cause, it will be difficult to reverse without refinishing. When the glaze of your bathtub starts to become worn, you’ll notice that the ability to fully clean it becomes difficult. No matter how much hard you scrub, it still doesn’t look clean. 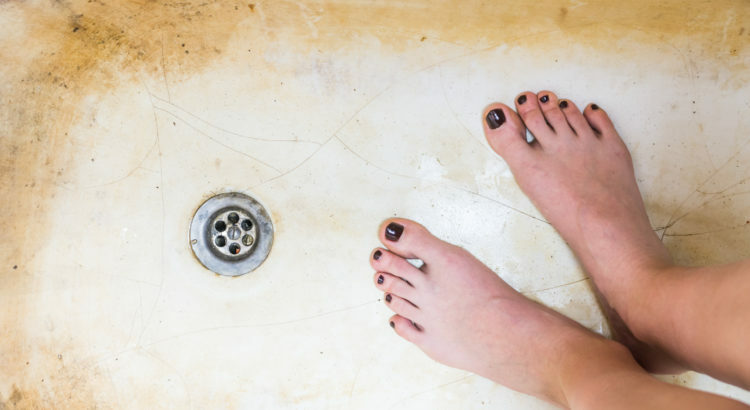 As the surface of old tubs becomes more porous, they allow more grime, dirt, and soap scum to live on your tub’s surface. Refinishing your bathtub will make cleaning and maintaining it much easier. After all, your tub is meant to make you feel clean- not dirtier! Over time, it’s expected that your once shiny new bathtub will fade. However, when it starts to become extremely dull, it can make it look dirty and reveal its age. With the coating no longer protecting your tub, it can also cause water damage to the inner material. A quick refinishing job can take care of this issue, leaving your tub looking brand new again! If your bathtub is looking discolored, dull, and dirty, it’s time to schedule a refinishing service! Contact Eastern Refinishing today to inquire.